Earth – Best used in soft ground like earth and sand. Combination – Best used in dry, hard or medium ground conditions. Tungsten – Best used in hard ground conditions and asphalt. Precision depth control ensures the spoil auger has optimum ground clearance. Take advantage of every bit of valuable horsepower when trenching. Preset depths: 600 / 750 / 900mm. 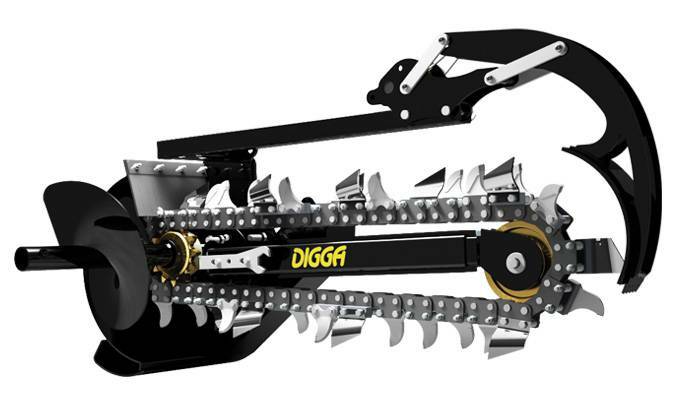 Digga’s new foot design also feeds overburden back onto the chain, transferring it to the spoil auger for a cleaner clearer work side of the trench. For pricing or more information about the Bigfoot Trencher fill out the form and we&apos;ll be in touch soon. Alternatively call (08) 9457 1544.